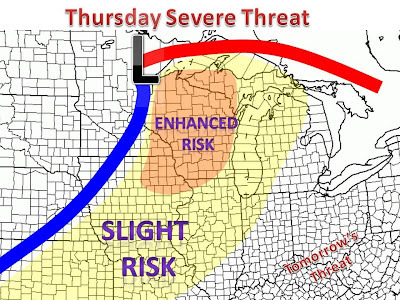 A strong cold front will pass through the Midwest today and tonight. With the Gulf hot and humid airmass in place the groundwork is in place for some towering severe thunderstorms. A severe thunderstorm watch has already been posted in Central Minnesota and NW Wisconsin, more watches are likely later today. Some scattered supercell-like thunderstorms are possible this afternoon in the slight risk area, main threat large hail and damaging winds. As the cold front moves through this evening a line of strong to severe thunderstorms will likely develop ahead of said front. Most short term models are showing this line moving through late during the evening. This could come as a "round two" for many later this evening. The main threat of severe weather in this line will be damaging winds. The rain will be welcomed for farmers, as a drought has been building from the Central Plains to Minnesota. The threat shifts east for tomorrow afternoon.